The mediation committee for the dispute between Samsung Electronics Co. and its former employees suffering from work-related illnesses announced the finalized settlement for the two parties, with the plan including compensation of up to 150 million won ($132,000) per illness. The announcement came as South Korea's top chipmaker and an advocacy group representing victims of work-related diseases, the Supporters for the Health and Rights of People in the Semiconductor Industry, inked an agreement in July to unconditionally accept the decision of a mediator on the contentious issue that has been unsettled for over 10 years. Under the plan, Samsung Electronics will provide maximum compensation for those suffering from leukemia. The company will provide different amounts for various other ailments, including miscarriage. The committee said the settlement focused on including as many victims as possible, while reducing the amount of compensation provided to each worker. The decision was made on the premise that the correlation between the working environment and disease is uncertain to some extent. All incumbent or former workers of Samsung and its subcontractors, who served at the company's chip and LCD production lines in Giheung, south of Seoul, since 1984 will be eligible to apply for compensation. The compensation plan also covers congenital diseases suffered by children of the victims. The mediation committee said the details of compensation will be assessed based on the duration of the victims' employment at Samsung. The committee added that it hopes the settlement will become a cornerstone in protecting workers' right to health in South Korean society. 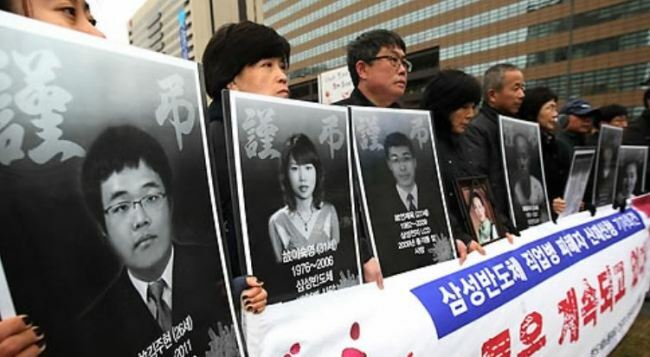 The standoff involving the South Korean tech giant surfaced when Hwang Yu-mi, who worked on a Samsung chip production line, died of leukemia in 2007. SHARPS claims that as of June 2018 there were 320 victims who suffered from work-related illnesses after being employed by Samsung, with 118 of them already having passed away. Victims have been claiming that Samsung should give compensation, apologize and come up with measures to prevent further outbreaks. Samsung Electronics will also donate 50 billion won to public organizations to help improve workers' safety and health in the country. The committee said Samsung and SHARPS will hold a ceremony to finalize the agreement within this month. The deadline for the compensation is Oct. 31, 2028, although it can be extended depending on circumstances. While the plan will cover all 53 victims who are members of SHARPS, they will have the option of choosing between the latest announcement and the previous compensation proposed by Samsung Electronics. Samsung started direct talks with the advocacy group in 2013. The two parties failed to reach an agreement, with the first mediation, announced in July 2015, ending without making any progress.